← What a fantastic idea! 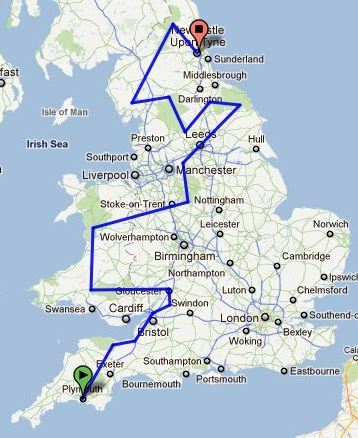 This kind of makes our Coast 2 Coast venture look a little small fry! Announcing, England-Wales-England: EWE. A multi-day mountain bike race in the UK to be held in 2012. Having raced the Tour Divide and Iditarod Trail Invitational, I’ve seen some amazing places and enjoyed racing through them. The UK has plenty of amazing places, too. England-Wales-England will be a race with similar ideals, but playing to the strengths of mountain biking in our country. A closer model than the Tour Divide would be the Colorado Trail Race: we don’t do giant empty dirt roads, but we do do engaging and challenging mountain biking. We do crazy weather. We do more remote than some people would think possible on a crowded little island. This is a race. If you are a “finisher” and not a “racer”, don’t bother. Just download the route and ride it in your own time. Will be based on the rules for the CTR, see here. This is where we will need some help. I’ll be seeking advice from local riders to put together a challenging route that hits some of the great riding we have here. The intended nature of the riding will be biased towards what would be fun on a day ride, rather than what makes for easy mile-munching. The map below will give you an idea, and it will evolve as we plan the route out. If you’re a local and you can help with a route through your patch, then please do get in touch. One outcome of this endeavour will be a new long-distance UK route. For racers, tourers, or people wanting to ride sections. I think that will be great! Because I’ll be organising this in my “spare” time. Scotland would be a fine addition if things go well, making it EWES. Don’t bet on it. Straight lines are for birds, not mountain bikers. Want to Contribute to the Route? Fun – something that you would consider a good day-ride on an unladen bike. Legal – no cheeky footpaths, no matter how good they are. Local – show off your area. We want the trail to show the character of the areas it passes through. If there is a trail that you would absolutely have to take a visiting rider to, then take the route there. Don’t worry about the exact location of the magic line, I’ll sew the sections together somehow. The route shouldn’t go on crazy loops, but meandering to hit good trails is encouraged. Supply stops – work them in if they are possible, but 100 miles with no resupply would be OK. More than that and we’ll have to consider it.